In its work to advance workforce and build a solid talent pipeline, it has become obvious to Central Six executive director Antiqua Cleggett that workforce development and economic development are inextricably linked. That is at the core of Central Six’s mission. Central Six serves six central Alabama counties – Blount, Chilton, Jefferson, Shelby, St. Clair and Walker. Central Six seeks to connect employers with a well-trained base of potential employees. It is a part of a larger statewide network, AlabamaWorks, that trains, prepares and matches job seekers with employers. Central Six works with clusters of different industries to connect companies to a talent pipeline that Central Six has played a key part in establishing. CMC Steel is a member of Central Six’s Advanced Manufacturing Industry Cluster and has been highly involved in workforce development within its sector. In its five years of operation, Central Six has had a multitude of success stories connecting roughly 50 employers across varying industries to talent. It has funded over half a million dollars to community colleges to outfit its health care and manufacturing programs, in turn creating a skilled workforce in those industries. Hundreds of girls in middle school and high school, along with their mothers, have been exposed to the construction industry through Central Six – a career they might have known nothing about otherwise. In fact, at the most recently career fair, nine employers in the construction industry offered 50 attendees jobs, right there at the fair. Central Six is a stakeholder in a grant that provides electrical or welding training to the homeless population – and every single person that completes the training is offered a job. Central Six works extensively with K-12, two-year institutions and four-year institutions to help create pipelines to varying industries so individuals can go to work and ease seamlessly into a career path. If employers are willing to share a bit of their time, Cleggett said, she and her team will help them work through workforce challenges, anything from helping build soft skills into a company’s onboarding process to finding people to fill vacancies in employment. 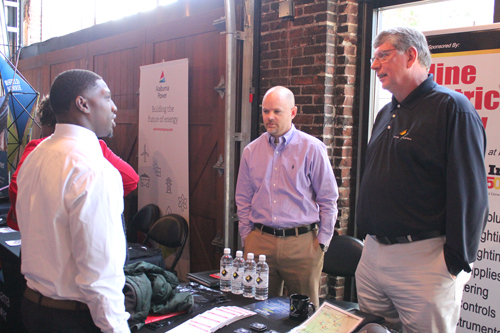 “We are happy to help host job fairs where we are able to bring people out and try to find qualified, skilled workers,” Cleggett said. As the lead economic development organization for the Birmingham region, the Birmingham Business Alliance has helped Central Six to thrive. The BBA’s senior vice president of public policy, Waymond Jackson, serves as chairman of the Central Six Development Council’s board of directors. The BBA has played an important role with Central Six, Cleggett said. At the core of Central Six’s purpose is strengthening workforce development, and, as a result, economic development for the six counties the organization serves, providing a better quality of life for the counties’ citizens. It is work that Cleggett takes immense pride in.